October not only rings with autumn, it also starts off with some great events all around the world. Starting in Germany, Munich is hosting the Oktoberfest, a Beer Festival celebrating, you guessed it, Beer. Fourteen tents serve different kinds of beers, chicken, roasted pig, sausage and other delicacies. Next to the Beer Tents you can enjoy yourself on a number of rollercoasters, swing carousels of different sizes (the highest one goes up to 50 meters), horror houses and of course the center of the Oktoberfest, the gigantic Ferris wheel. When you’re in there you’ll not only overlook all of Munich but will even be able to see the alps. And for those who prefer a more relaxing experience, the Oktoberfest offers the ‘Old Oktoberfest’ which features vintage rides and attractions. The Oktoberfest lasts from the 22nd of September until the 7th of October 2018. If you missed it this year, save the date for next year, 21st of September until the 6th of October. Let’s continue our tour and head to the adventurous Autumn Fair in Basel, Switzerland. This year it starts on the 27th October and goes on until the 11th of November 2018. The fair has medieval roots and has been going on annually since 1471 without interruptions. During this period, the city of Basel witnesses an impressive combination of lights, perfumes and sounds. The fair spreads over seven of the city’s plazas and the trade centre hosting hundreds of small artisan craft stores, food stalls and exciting rollercoasters. 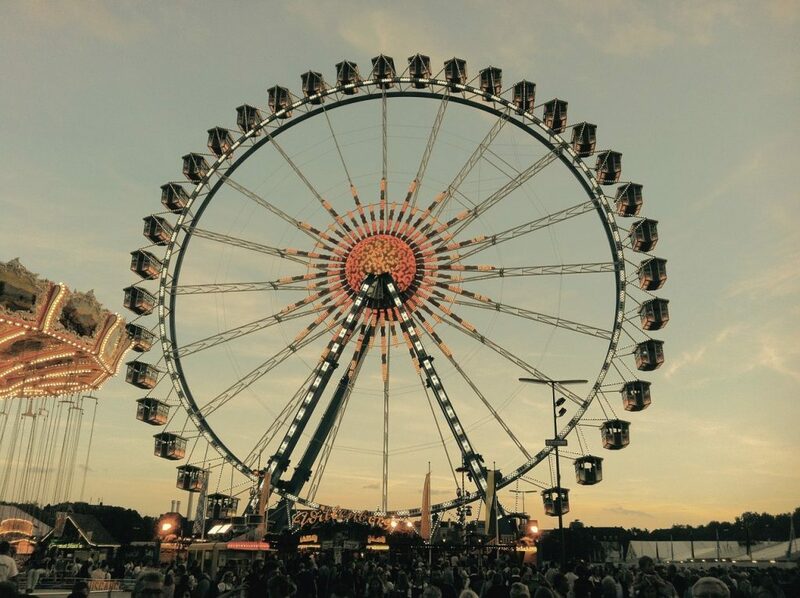 For all who want to enjoy a bird view over the city and the Rhine river, there is an enormous Ferris wheel on the Münsterplatz. If you desire an adventurous and remarkable travel experience during the month of October, we recommend you to visit those two impressive cities. And do not forget to take your Ruigor backpack with you!